In the 1990's the Dynaco name was acquired by Panor Corporation. In 1995 they came out with two tube amplifiers. Both amps were wired only - no kit versions. 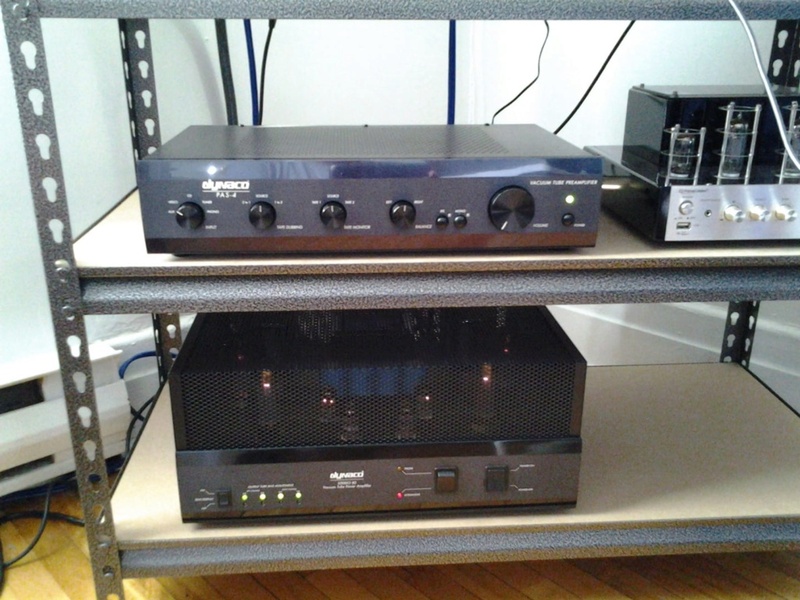 The ST-80 @ 40 WPC and the ST-160 @ 75 WPC. Now why they didn't call it the ST-150 for its 75 WPC, I will never know? Unfortunately both amps came out at a time when solid state gear really had a foothold on audio and neither amp sold in large numbers. Rarely will you ever see one for sale on Ebay and when you do they sometmes reach prices higher than their original sale price. Both amps had almost the same circuit. The ST-80 used EL34 output tubes and ran a B+ of 480 volts (about 40 to 50 VDC higher than the original Dynaco ST-70). The ST-160 used 6550 output tubes and ran a B+ of 540 VDC (!! pretty high for a 6550). Both amps had individual bias pots on each output tube that were adjust using LED's. Turn the bias pot too far down and the LED was green. Turn the bias pot too high and the LED turned red. If it did not glow at all, the bias was right on. The LED's were set so that an EL34 on the ST-80 was biased at 40 milliamps. On the ST-160, when the LED did not glow, each output tube was set at 50 milliamps. 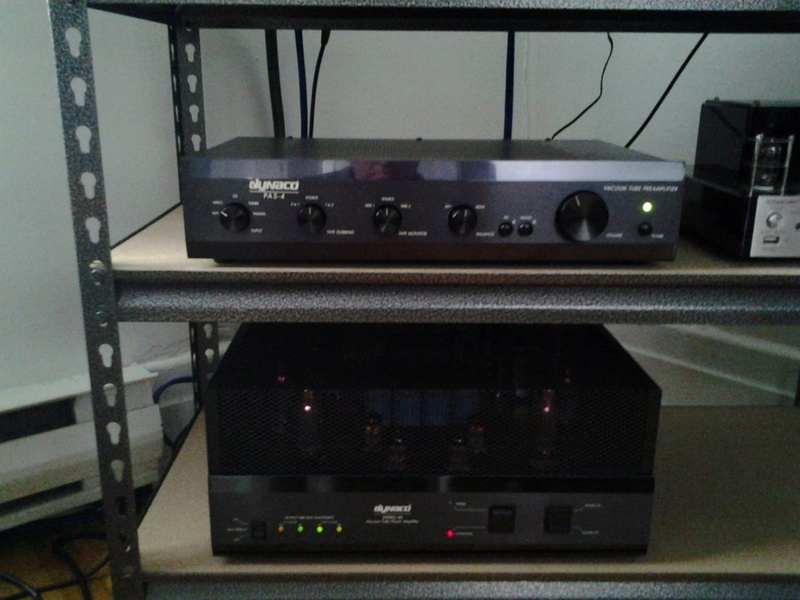 Both amps used a single 12AT7 (voltage amplifier) tube and a single 6DJ8 (phase splitter/inverter) per channel. Both amps also had triode/pentode (ultralinear) switches, a variable input pot and solid state rectification. I personally have never heard one of these but I have heard the PAS-4 preamp that came out at the same time. The PAS-4 is a lot better sounding than the original Dynaco PAS-(2 or 3) preamps. Maybe if these amps came out in the 2000's when tube gear and vinyl records had a resurgance or if they were also offered as KITS at a lower price, they may have caught on ? Below are two links to the user manuals for each amp in pdf format. I want to thank sKiZo for hosting both manuals on his web site. Anther ST-160 link below .. I Have the 2 model Dynaco PS-4 And The Ampli Stereo 80 that's realy good sound It,s Realy Différent construction and Sounds of Qualité Or the Model Fabrication 70' ,,,it'S Sound More better . From another venue - and he does not even own one. They must be quite rare. and Stereo 160 back in 1993 for Dynaco when owned by Panor Corp.